I remember coming home sick on the last day of 8th grade year. For the past several years, I’ve had this jinx that made me sick on the last day of the school year. However, just like how flu seasons come with a vaccine, this so-called curse came with a cure—a healthy Vietnamese spring roll that rinsed away all the sickness. I’m not too fond of eating, but if I were to name a few of my favorite dishes, this would definitely place at the top. 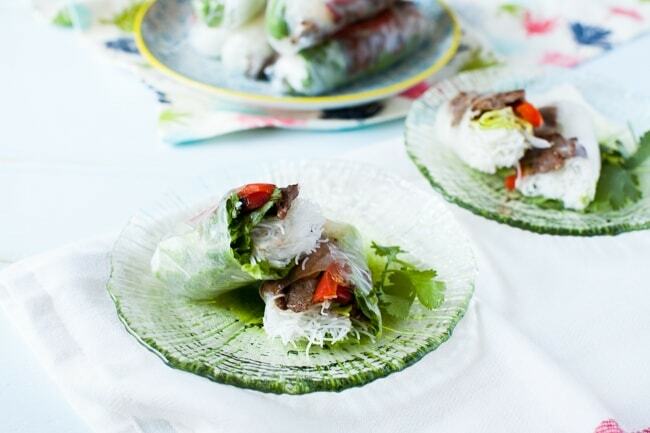 Unlike American spring rolls, Vietnamese spring rolls are not fried and can be made at home easily. All foods are great, but not all of them are sustainable in the process of obtaining the ingredients. We will not only explore the origins of the ingredients in making this spring roll, but also discuss how to revise this recipe with local, more sustainable ingredients. The traditional Vietnamese spring roll seems relatively healthy in the eyes of the consumers. However, when carefully observing each ingredient that goes into this recipe, one can see that many of the ingredients are not produced environmentally friendly. The main ingredients to the traditional Vietnamese spring rolls include: rice paper, beef, eggs, vermicelli noodles, lettuce, bell peppers, and carrot. Beef and eggs are high in protein and thus nutritious, but they are far from healthy in the perspective of the environment. According to the Green Eatz website, the total greenhouse emission produced on the farm, in the factory, and on the road for 1 kilogram of beef produces carbon dioxide equivalent to about 27 kilograms. Though eggs’ carbon emission—4.8 kilograms of carbon dioxide per 1 kilogram of eggs—is relatively small compared to that of beef, their combined carbon emission is significant. There needs to be a way to reduce this number by switching to more sustainable ingredients. In order to make this Vietnamese spring roll more sustainable, these high carbon-emitting ingredients need to be switched out. By taking out beef and eggs from the original recipe, the amount of carbon emission is saved drastically. Firm tofu can be used in place of beef and eggs since it is also rich in protein and produces only about 2 kilograms of carbon dioxide per kilogram of tofu (Richards). Unlike cattle and poultry farms, which produces a lot of carbon and methane gas, tofu is made from beans produced by plants, which is a much better alternative. Vietnamese spring roll is not limited to these ingredients, however. As long as all the ingredients are prepared correctly, they can be wrapped into the spring roll. 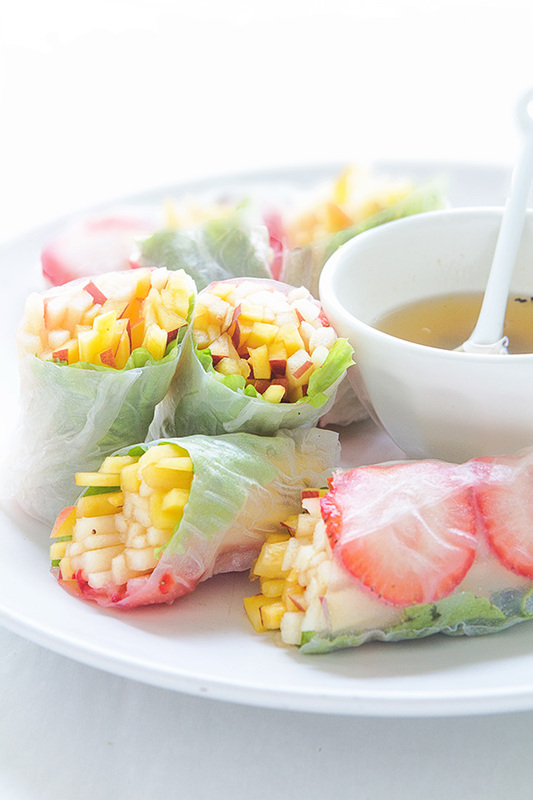 One way to make this spring roll healthier is to add fruits and more vegetables. By removing meat and adding more fruits and vegetables, this spring roll will be full of natural sugars and gluten free. Adding ingredients like tomatoes, cucumbers, and peach or strawberries is also relatively inexpensive and environmentally friendly. Even when switching meat with tofu, and adding fruits and more vegetables, one serving still costs less than five dollars. By revising a few ingredients, spring rolls can be made sustainable by increasing nutrients, decreasing costs, and helping the environment. We can help lower carbon emission further than just cutting back on the consumption of meat. Although eating greener could help trim down on carbon emission, the most sustainable option is growing your own organic garden. According to Wendell Berry’s book, A Continuous Harmony: Essays Cultural and Agricultural, adopting a lifestyle that incorporates an organic farm “is growing it organically, is improving a piece of the world. He is producing something to eat, which makes him somewhat independent of the grocery business, but he is also enlarging, for himself, the meaning of food and the pleasure of eating” (82). The food will be free of preservatives, and it will be fresher and more nutritious. Growing your own food will make our food tastier because we worked hard to obtain it. Although growing our own garden takes away our freedom to just get on the car and shop at the market, Berry argues that “To have a healthy environment we will all have to give up things we like; we may even have to give up things we have come to think of as necessities” (81-82). Convenience follows a sacrifice; we are sacrificing our convenience to grow an organic garden. Likewise, we are sacrificing our environment for convenience. If we want to preserve our environment, then we inevitably have to give up something in return. It’s not the end of the world for switching out a few ingredients from the original recipe. What is important is that by choosing a more sustainable option, it will help the environment from too much carbon emission and reduce costs by getting cheaper, healthier ingredients. We don’t have to give up driving completely or revert to agrarian lifestyle; by taking less trips to the grocery store or choosing greener options, a positive mutual relationship with us and the environment is within reach. 1. Start a large pot of boiling water and cook vermicelli noodles according to instructions on the package. 2. Prep and clean the lettuce, bell pepper, carrot, cilantro, and basil leaves. 3. Slice the beef and cook it with any seasoning of your choice. 4. Fry eggs and thinly chop them and place all ingredients neatly in a plate. 5. Dip the rice paper in water to loosen it and place all the ingredients together. 6. Put sriracha sauce (optional). 7. Wrap the ingredients as shown in picture. 1. Start a large pot of boiling water and cook vermicelli noodles according to instructions on the package (optional). 2. Carefully rinse the tofu and slice it. 3. Prep and clean the lettuce, bell pepper, carrot, tomatoes, cucumber, fruits, cilantro, and basil leaves. Pick and choose which ingredients to add. 4. Place all ingredients neatly in a plate. 7. Wrap the ingredients with rice paper. Caspero, Alexandra. 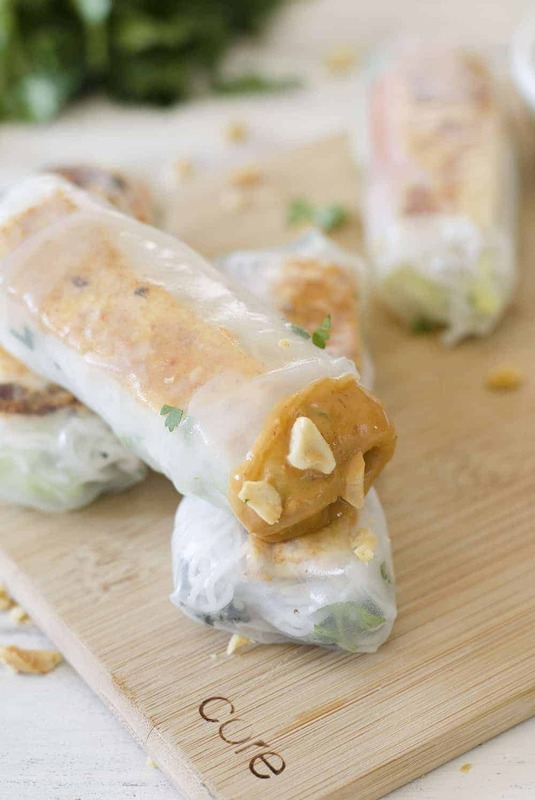 “Vegan Vietnamese Tofu Spring Rolls.” Delish Knowledge, California, 25 Mar. 2016, https://www.delishknowledge.com/vietnamese-tofu-spring-rolls/. Causey, Jennifer. 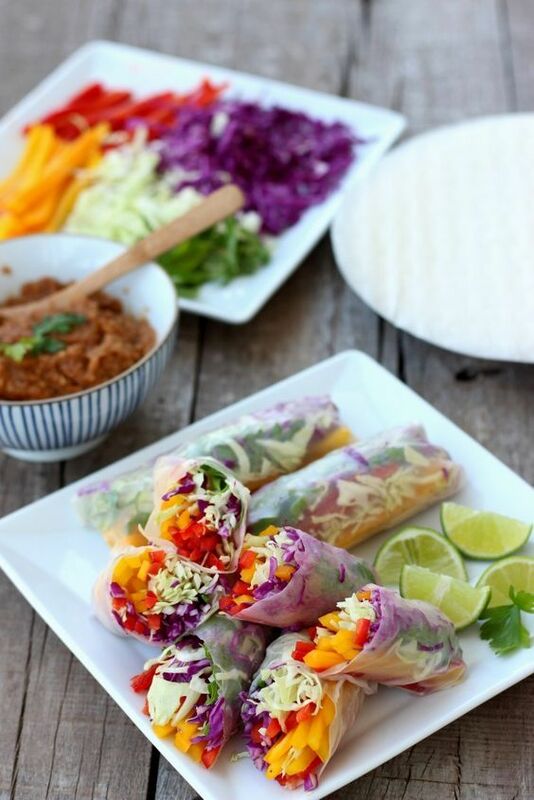 “Tuna Summer Rolls.” CookingLight, United States, 23 Jun. 2017, https://www.cookinglight.com/food/recipe-finder/differences-between-spring-and-summer-rolls-vietnamese-appetizers. Deily, Julie. “Vietnamese Spring Rolls with Grilled Lemongrass Beef.” The Little Kitchen, Florida, 28 Jul. 2016, https://www.thelittlekitchen.net/viet-fajitas/. Felicia. “Rainbow Vegetable Rolls & Spicy Peanut Sauce.” Dish By Dish, Buenos Aires, 24 Nov 2014, http://dishbydish.net/2014/11/24/rainbow-vegetable-rolls-spicy-peanut-sauce/. Kristie. “Veggie spring rolls with spicy peanut dipping sauce.” The Mostly Vegan, California, 14 Jul. 2016, http://www.themostlyvegan.com/veggie-spring-rolls-with-spicy-peanut-dipping-sauce/?epik=0-xFtE_IWX1Jw/. Robinson, Naomi. “Summer Fruit Spring Rolls.” Bakers Royale, United States, 10 Jul. 2014, http://www.bakersroyale.com/summer-fruit-spring-rolls/. Stafford, Gemma. “Summer Fruit Spring Rolls.” Gemma’s Bigger Bolder Baking, Bigger Bolder Baking, 30 May 2016, www.biggerbolderbaking.com/fruit-spring-rolls/.